Observation - Velvet Shank - UK and Ireland. 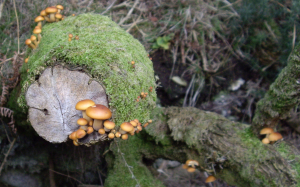 Description: This fungi is growing on an old gorse stump. the first photo was taken two weeks ago, now the cap has flattened as shown in the second photo. This fungi is growing on an old gorse stump. the first photo was taken two weeks ago, now the cap has flattened as shown in the second photo.